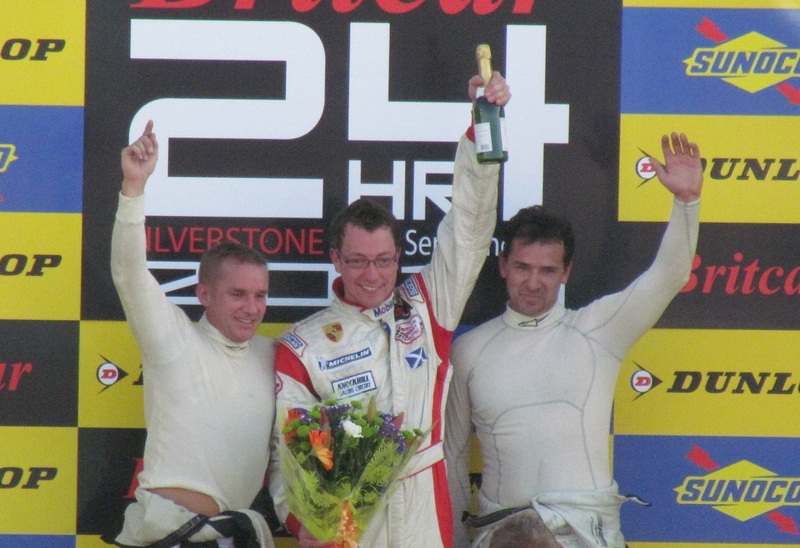 Oly Mortimer clinched the 2011 Porsche GT3 Cup Driver of the Year award after the final rounds of the season were held over the weekend at Silverstone as part of the Britcar24 event. Mortimer went into the final three races with a slender 3 point advantage over Graeme Mundy despite securing 7 wins from the 10 races in the season so far. A failure to finish at Croft back in April meant the season went down to a nail-biting finish in the final race of the season on the new Silverstone Grand Prix track. Oly started the weekend in good form securing pole position for the first and second races of the weekend with his fastest time of 2 minutes 12.7 seconds ahead of Steven Liquorish whose fastest time was 2 minutes 14.4 seconds. Despite this, Mortimer sustained minor damage to the Porsche 997 GT3 Cup after a slower Club Class car ran into him during the qualifying session. Graeme Mundy qualified at the back of the field after failing to take the track due to a mechanical failure. Race 1 saw a fantastic drive from Graeme Mundy from the back of the grid who was soon chasing Mortimer who set the early pace after a great getaway from the start line. Mundy was flying through the pack and by Lap 6 was able to use his extra 20 bhp to get in front of Oly and was able to pull a 2.6 second lead over the Edinburgh based driver until Mundy’s car suffered mechanical failure with a gearbox issue relegating him to 3rd place behind Mortimer who retook the lead on Lap 10 to take the chequered flag followed by Liquorish in 2nd place. Race 2 followed a similar pattern with Oly fastest away from the line and a storming start from Mundy from the back of the grid into 3rd place by the end of the first lap. By Lap 3 Mundy had made his way into 2nd place but Mortimer had extended his lead up front to over 10 seconds. By Lap 7 Mundy had closed down this gap to just 0.4 seconds after traffic from the large 34 car entry slowed up Oly and a spin allowed Mundy to take the lead. Mortimer finished 2nd 0.9 seconds behind Mundy but crucially scored an additional bonus point for fastest lap which cancelled out Mundy’s additional point for finishing 1st and getting an automatic 1 point bonus for starting on pole on Race 3. As the temperature rose to 27 degrees Celsius at Silverstone in the tropical October sunshine the third and final race of the weekend and final race of the season saw Mundy and Mortimer start 1st and 2nd on the grid in the showdown for the Driver of the Year title. Mortimer needed at least 4th place to secure the title regardless of Mundy’s finishing position but it was Mortimer who got the jump on his rival at the start taking the lead as the cars went into Copse. Mundy’s pace proved difficult for Oly to hold off and by the end of the first lap Mundy was back in the lead and on Lap 5 Steven Liquorish also passed for 2nd with Mortimer keen to gently coax the car home avoiding any unnecessary action in the field. After a controlled race for 11 laps Mortimer finished the final season of the season 18 seconds behind Mundy in 3rd place in his worst finish of the season but this proved enough to win the championship in his debut season. Oly is looking to move into the televised Porsche Carrera Cup championship for 2012 and is looking for additional partners to help fund his step up to the next level. Interested parties should contact Arcadius Sports using the details below. This press release was distributed by ResponseSource Press Release Wire on behalf of Arcadius Sports Ltd in the following categories: Men's Interest, Leisure & Hobbies, Sport, Motoring, Business & Finance, Media & Marketing, Transport & Logistics, for more information visit https://pressreleasewire.responsesource.com/about.